The device has been included in the Android One programme, which means it will receive regular monthly security patches for three years and two Android OS updates right after they are released. HD Global launched its budget offering, the Nokia 3.1 in India on Thursday. The device has been included in the Android One programme, which means it will receive regular monthly security patches for three years and two Android OS updates right after they are released. Another talking point about the Nokia 3.1 is the HD+ screen with an aspect ratio of 18:9. On account of its display, HMD Global is touting the Nokia 3.1 as a multimedia phone at an affordable price point. Up front, the Nokia 3.1 has a 5.2-inch screen with a resolution of 1440x720 pixels. Conforming to the latest trend in screen sizes, Nokia has gone with a taller screen. The display comes covered with an unspecified version of Corning Gorilla Glass for protection against nicks and scratches. The Nokia 3.1 houses an octa-core Mediatek MT6750N clocked at 1.5 GHz coupled with either 2GB or 3GB of RAM. Indian markets will get only the 2GB variant which comes with 16GB internal storage. The 3GB variant, on the other hand, features 32GB internal storage. The storage can be expanded to 128GB via microSD card. The Nokia 3.1 runs Android 8.0 Oreo, with affiliation to the Android One programme. The primary camera on the Nokia 3.1 is a 13MP snapper with f/2 aperture. It comes with auto focus and LED flash. The front camera has an 8MP unit with f/2 aperture, fixed focus sensor and 84.6-degree field of vision. 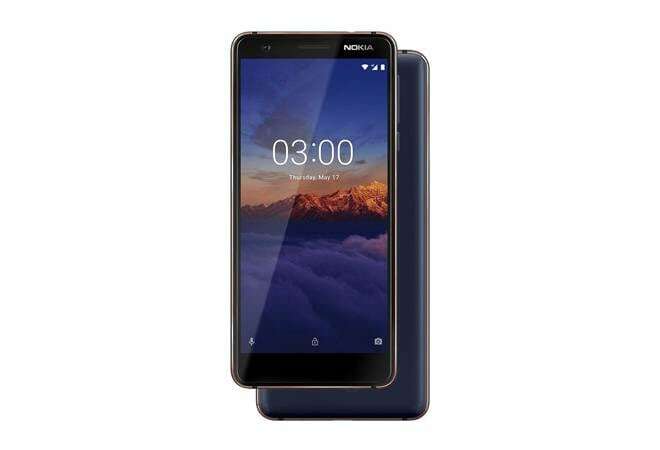 For connectivity options, the Nokia 3.1 has a 3.5mm audio jack, Micro USB 2.0, LTE Cat4, Wi-Fi 802.11 a/b/g/n/ac, Bluetooth 4.2, and GPS, AGPS, GLONASS, and Beidou. The device is powered by a 2,990 mAh battery. It is available in Blue/Copper, Black/Chrome and White/Iron colour options. The 2GB variant of Nokia 3.1, which will be coming to Indian markets, will be available at Rs 10,499. It will be available for purchase at major offline retailers, Paytm Mall and Nokia's online store from July 21. Buying the Nokia 3.1 from brick and mortar stores using Paytm Mall QR Code will get the buyer 10 per cent cashback on subsequent recharges and bill payments on Paytm. Nokia 3.1 buyers will also be eligible for two Rs 250 movie cashback vouchers which can be redeemed on buying minimum two movie tickers using Paytm. Buyers using credit and debit cards from ICICI Bank will get 5 per cent cashback.